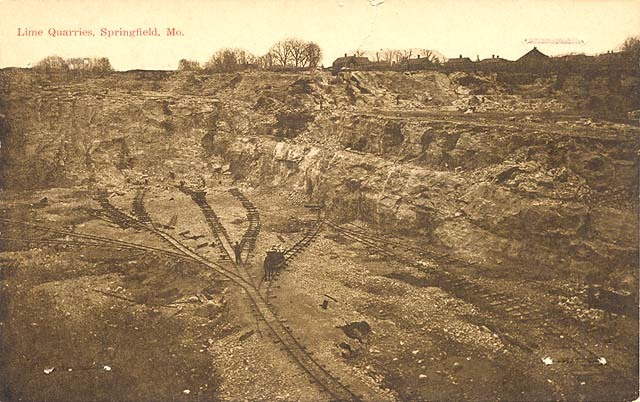 The photograph in the postcard shows a lime quarry in Springfield, presumably the one at the intersection of National Avenue and East Trafficway. The quarry has an interesting history beginning in 1884 when James H. Smith built a kiln at the junction of the St. Louis and San Francisco and the Kansas City, Fort Scott and Memphis railroads. Smith sold one-half interest in the kiln to J.G. Schermerhorn. Later J.S. Atkinson purchased an interest and another kiln was added. This group formed the White Line Association. More kilns were added in 1885 and 1886. In 1894 the Marblehead Lime Company of Chicago bought the company. 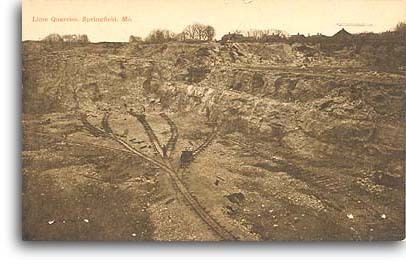 Marblehead acquired land in all directions from what is now National Avenue and East Trafficway. In 1941 the Ash Grove Lime Company purchased the quarry. Both the Ash Grove Lime and Portland Cement Company operated in this location until 1963, when the quarry was abandoned. It is estimated that over six billion pounds of rock came from the quarry. After the quarry was abandoned in 1963 it lay idle for a year and then was opened as a landfill for trade wastes. It operated as a landfill until 1970 when health officials began to fear the landfill was a hazard because it contained combustible waste. It was closed completely for six weeks in 1971 while the Missouri Geological Survey investigated. It was allowed to continue functioning until September 1972 when it was ordered to stop taking waste. Jim Hedges of Hedges Construction Company took over the fill on New Years Day 1973. That same day a fire broke out. Because of the large amount of combustible materials, the fire burned for several weeks in 1973 and then flared up again in 1976. Smoke containing harmful gasses spread throughout the area of the quarry, affecting the businesses nearby. Big cranes were used to fight the fire as well as United States Navy equipment. Water mains had to be relocated to provide enough water to battle the blaze. The huge pit remained full of greenish water until April 2001 when the quarry was drained so it could become a part of Jordan Valley Park. Work toward that end continues at the old quarry site.